Word circulated over the internet that Cherry Mobile Alpha Prime 5, a Windows 10 powered smartphone, will be up for grabs in as early as next month. The smartphone which was initially seen in Computex Taipei 2015 rocks a 5-inch HD display and ticks with Snapdragon 210 quad-core CPU. 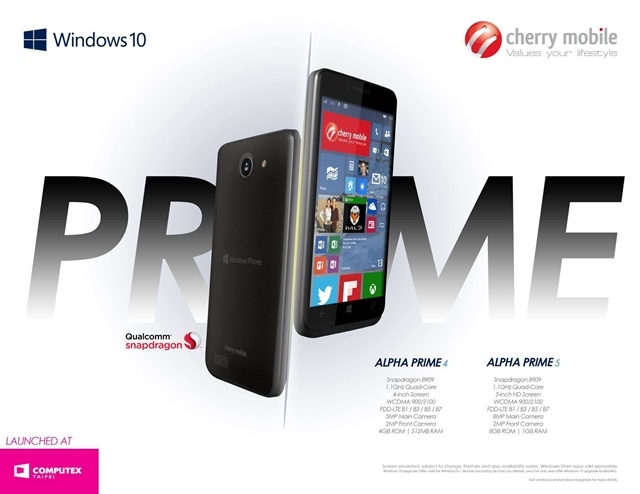 The Cherry Mobile Alpha Prime 5 will be offered at a very affordable price of Php 3,999 which makes it one of the cheapest Windows smartphone in the world just like the Alpha Style handset back in 2014. Apart from the Windows 10 OS, one of the noteworthy features of the handset is the LTE capability for faster mobile connectivity. At this price standpoint, the Cherry Mobile Alpha Prime 5 is pegged to be a great smartphone for those who wanted out of the already crowded iOS and Android platforms.